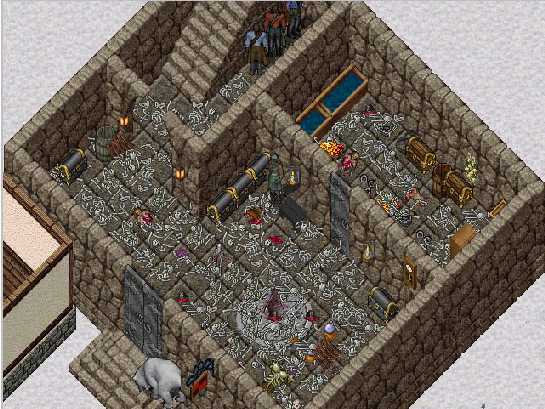 Last visited by Keeshi – January 13th 2000A few eves past I decided once again to return to my old home on Ice Isle. 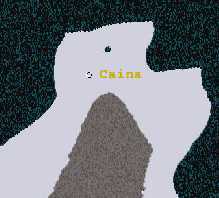 Thus it was I came across the recently created town known as Caina. Upon entering the first structure, known simply as The Slave Pit, I knew right off this was a place devoted to everything evil and vile. Despite my repulsion at the scattered bones and artifacts of wickedness I decided to continue my perusal of the city. Caina is located near the northern tip of the artic desert, the six buildings that make up the town are scattered about though very close to one another, easily discernable from the other houses which clutter the area by their red and black signs. Amongst these buildings are: The Slave Pit, The Scholomagie of Necromancy, the Sepulcher of the Damned, Golgotha, and the Chapel of Desolation which is a branch of the Temple of Evil. The undead and other evil folk that inhabit the town are found there at all hours of the day. Even during my late night visit I found the establishments, especially the Tower of Skulls known as Golgotha filled with all sorts of the vile ones. Despite our extremely different views on the virtues of the realm, and our allegiances the citizens of the town treated me with a mild amount of hospitality and made no physical attacks against me. Of all the sites here Golgotha is by far the most enormous of them all. This tower serves as the meeting place for the Shadow Conclave, and it’s other name ‘Tower of Skulls’ comes with good reason. When entering this building one is almost overwhelmed by the utter darkness of the tower and the rituals that are performed within. I would suggest any who can visit this place, it is a true testament to evil within the realm.